Mushroom pate – oh how I love mushrooms…. Another first for me recently was mushroom pate. 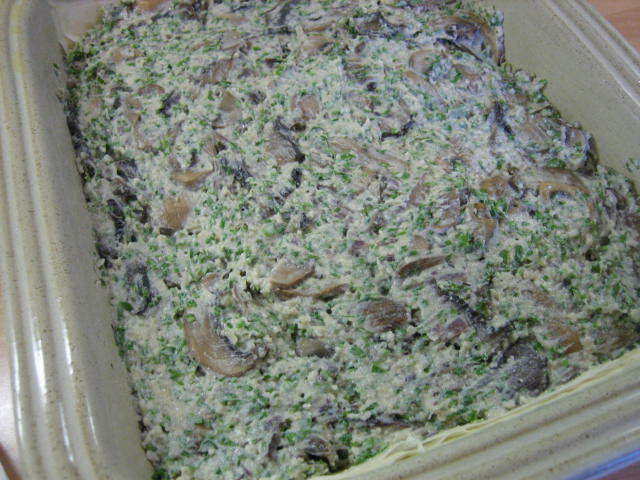 One of those things that I just have never tried to make – I love mushrooms and I love mushroom pate. I decided to serve this as the party I catered for too. Apologies that there are no photos of the finished product but I promise to add one when I make it again. It was very simple to make, very tasty and if you are a mushroom lover like myself I strongly recommend you give it a bash! Brush mushrooms to remove any dirt. Try to avoid washing them as they will absorb a lot of water. Slice mushrooms and saute in a non stick frying pan in a knob of butter and a splash of olive oil until cooked through and most if not all of the liquid released from the mushrooms has evaporated (do not brown). Leave to cool. 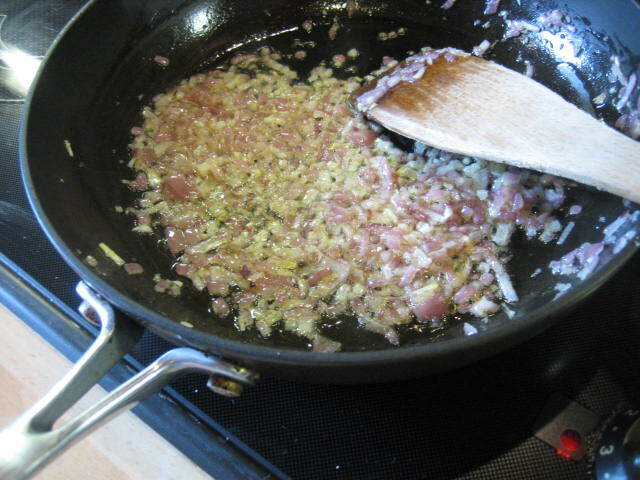 Finely dice onion and saute in butter and olive oil. When cooked through soft sweet and translucent (do not brown) leave to the side to cool. 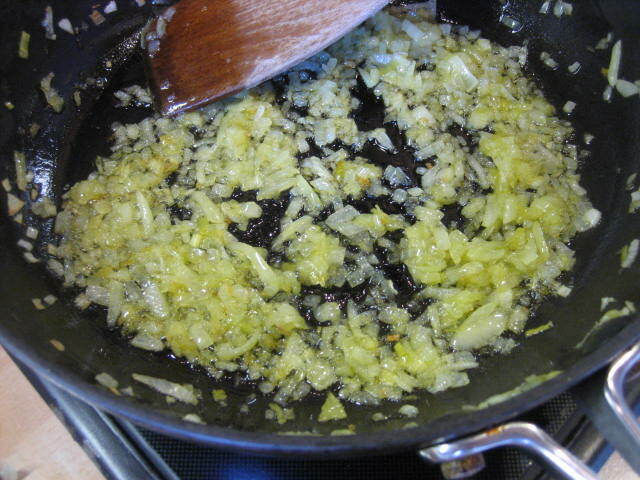 Juice the lemon and finely chop tarragon (1 tablespoon). 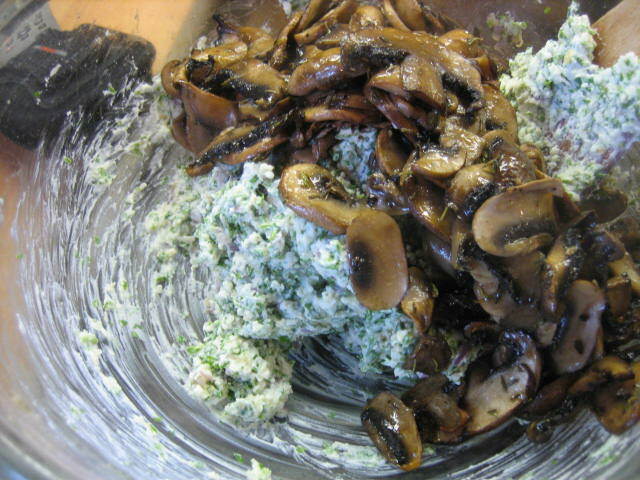 Add cooled mushrooms, cooled onion, cream cheese, lemon juice and tarragon to a food processor. Season with a large pinch of sea salt, several grinds of the pepper mil and about 1/4 of a finely grated nutmeg. Blend until smooth (a little bit of texture is quite nice so not too smooth). Taste and add more seasoning if needed and if you wish more lemon. Pile into attractive ceramic bowls and serve with mini oatcakes. Also delicious on hot buttered wholemeal toast for breakfast. 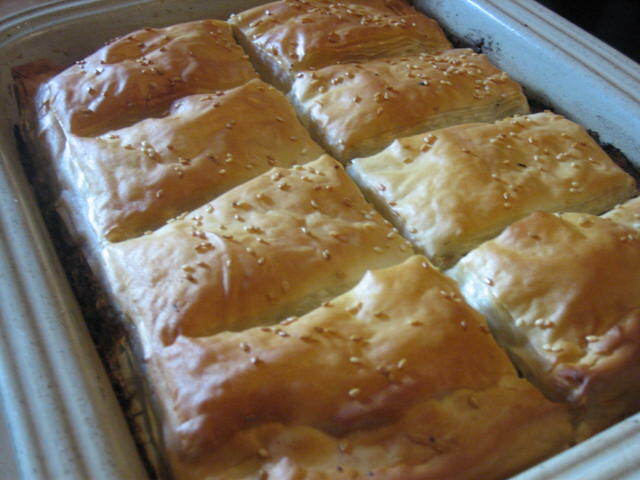 When I made the Spanakopita the other day I thought why limit myself to spinach! 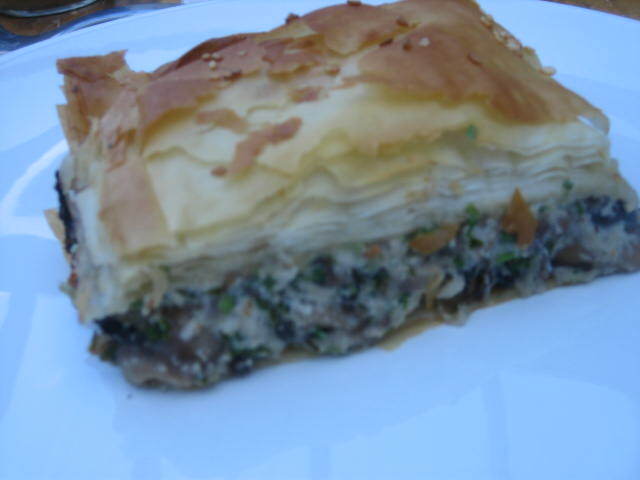 The flakey pastry lends itself really well to mushrooms. I absolutely love mushrooms but don’t really eat them very often. 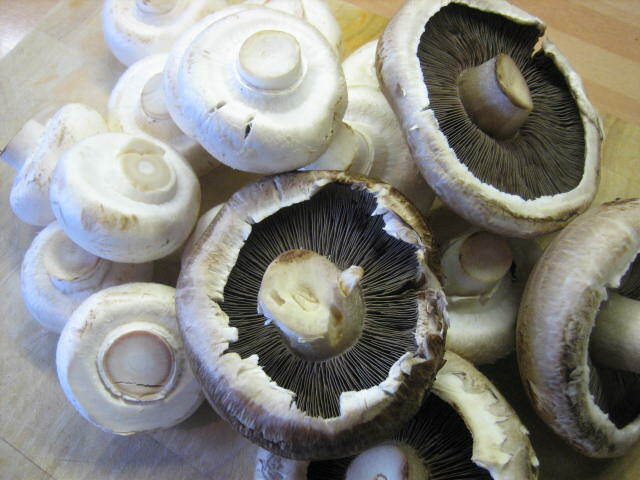 When I do eat them I tend to cook them very simply and have them for breakfast on toast or roast large whole mushroom in the oven with a bit of butter and fresh thyme. One thing that did concern me a little about using mushrooms is they tend to give out a lot of liquid which could be a bit of a disaster for filo. The ingredients must be relatively dry or you end up with a soggy pastry disaster. Nobody likes soggy pastry! 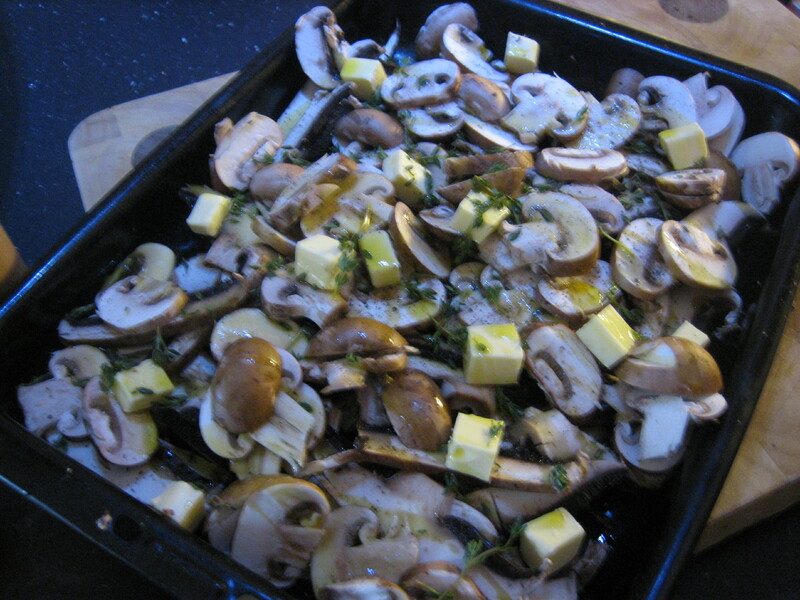 The key here is to slice the mushrooms and roast them in the oven until the liquid has evaporated. They will give out quite a lot of liquid and you will think that it will never evaporate but be patient it will. Brush off any dirt from the mushrooms. Do not wash them as they will absorb lots of water. 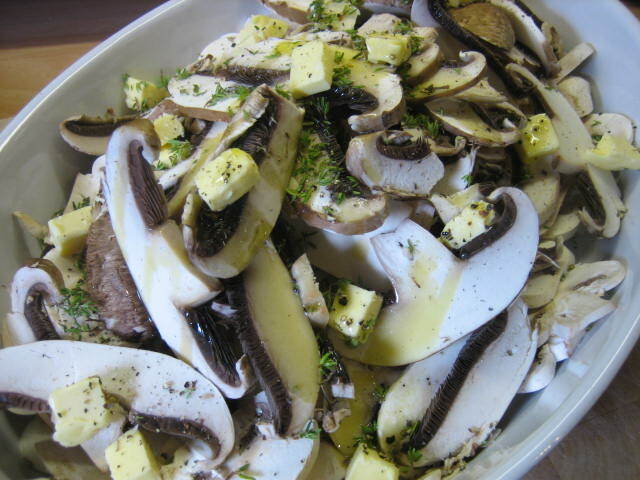 Finely slice the mushrooms and place in a large roasting tin or ceramic baking dish. 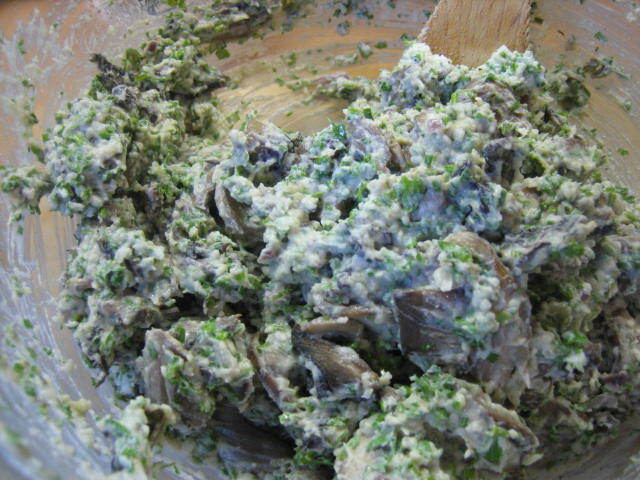 Use about 50 grams of the butter and cut into small pieces, dot this over the mushrooms. Strip the thyme leaves from the stalks and sprinkle over the mushrooms too. Drizzle with olive oil and season with salt and pepper. Bake in oven making sure you stir every ten minutes to ensure the mushrooms cook evenly. This will take about 35 – 40 minutes. 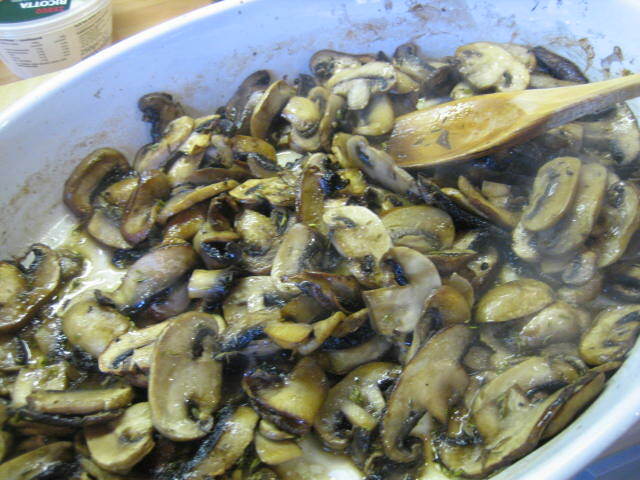 Depending on how mush liquid comes out of the mushrooms – make sure you cook them until nearly all the mushroom juice has evaporated. While this is happening finely dice the onion and garlic and saute in a little olive oil with a pinch of salt until soft and sweet. Leave to the side to cool. 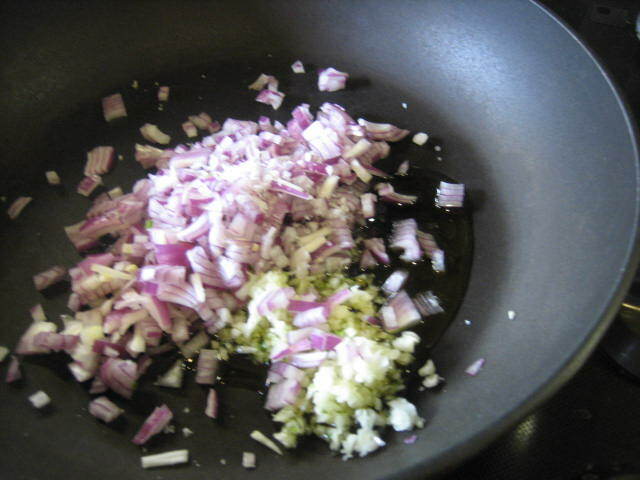 Finely chop the parsley and chives and add to a large bowl. 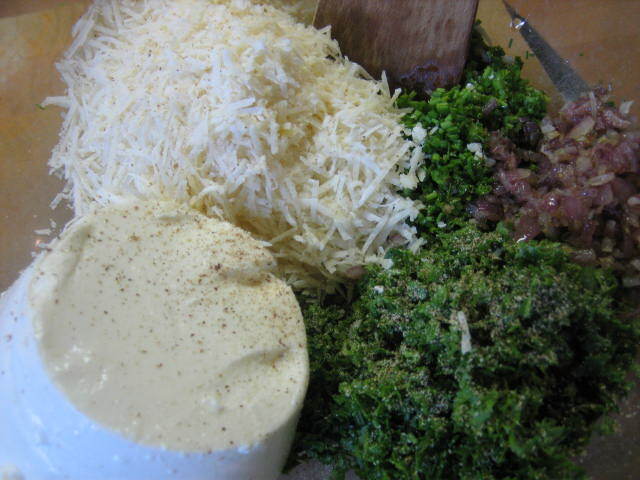 Finely grate the Parmesan and also add to the bowl along with the ricotta. 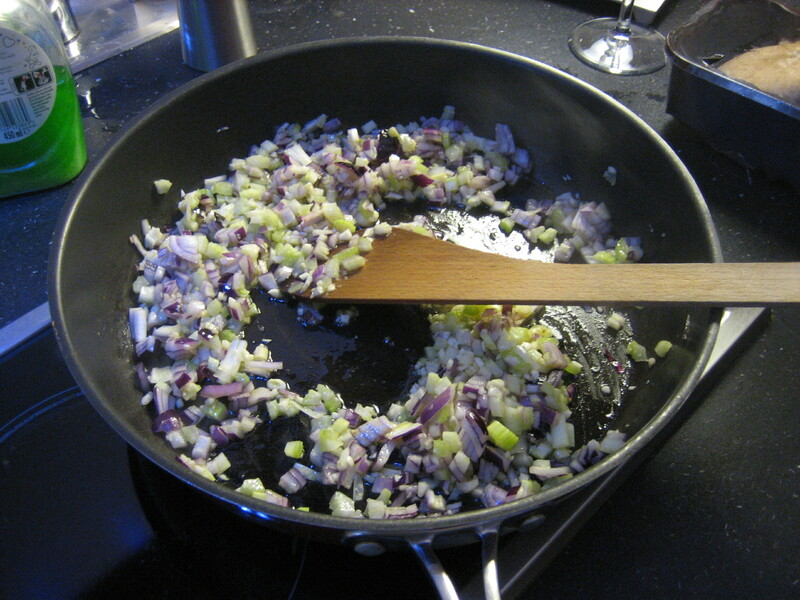 Once the onion is cool also add to the bowl with about 1/3 of a nutmeg very finely grated. Once the mushrooms are cooked remove from the oven and let cool slightly – I removed them from the ceramic dish and spread them out on a cold plate to speed this process along. When the mushrooms have cooled down a bit stir them into the ricotta and herb mix (they can still be warm just not piping hot). 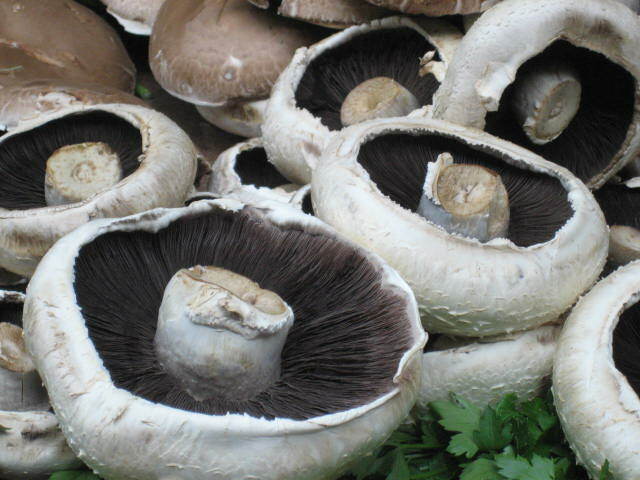 Make sure you do not add any “mushroom juice” to your mix – try and keep it as dry as possible. You are now ready to layer up your filo. Take the rest of the butter and melt. Chose a rectangular pie dish about the size of half a sheet of filo (no bigger). 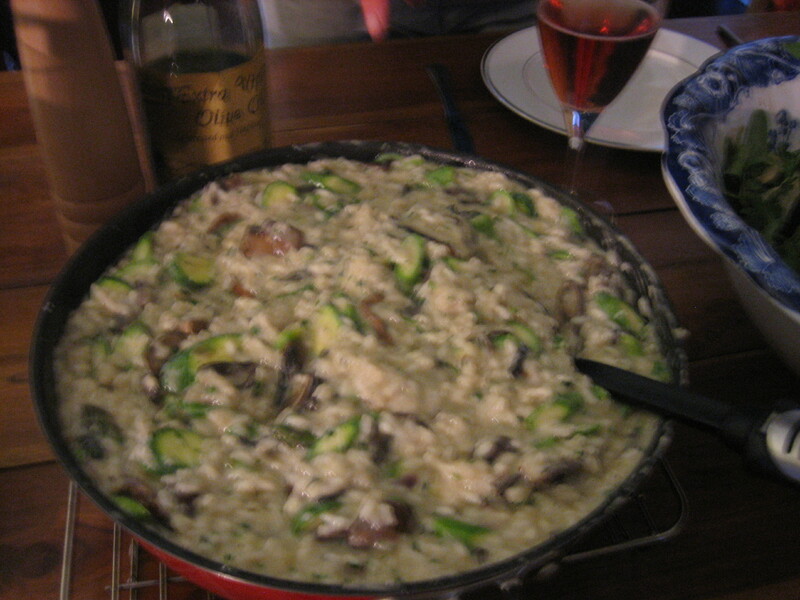 The dish can be ceramic, pyrex or metal. With scissors cut the filo pastry in half. ***Tip: Cover your filo with a damp tea towel or kitchen paper when you are not using it as it dries out VERY quickly. Brush the base of the pie dish with butter and lay a sheet of filo on top. 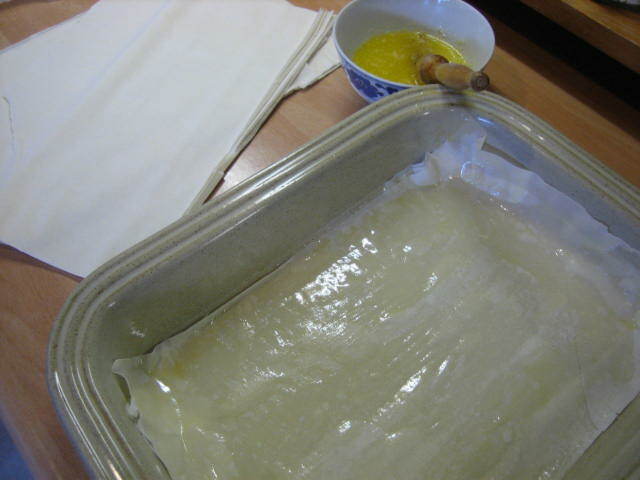 Brush this sheet with butter and lay another sheet on top keep going until you have layered up half the sheets. Take the mushroom mix dollop onto your filo layers. 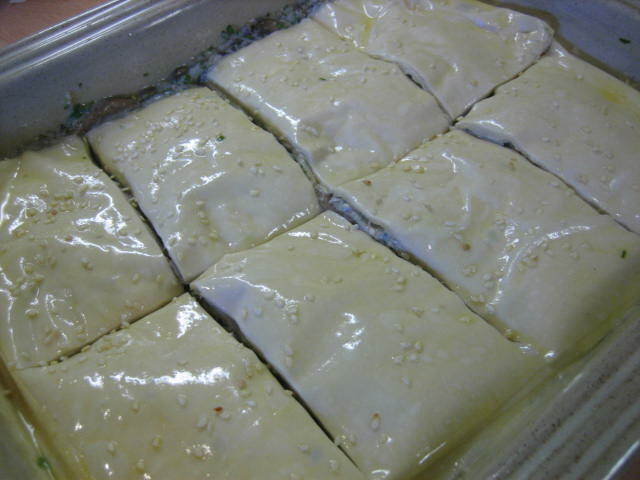 Spread evenly and then start layering the rest of the filo sheets in the same way. Brush the top of the pie with butter and then take a sharp knife and cut the top layers of pastry into portions. I got 8 good-sized portions out of mine. (do not cut all the way down to the bottom layers). If your filo pastry is a bit bigger than your dish tuck the overhanging edges down the sides of the pie dish. 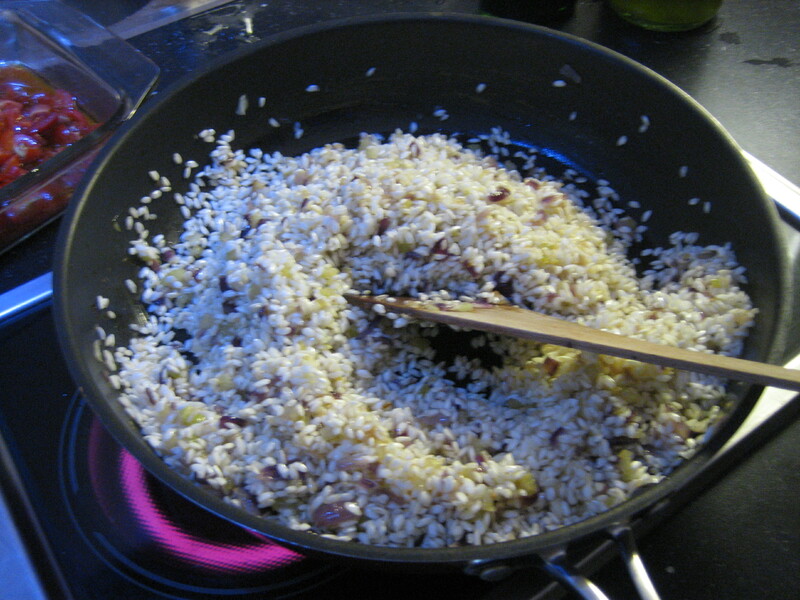 I then sprinkled the top of the pie with sesame seeds – this is optional. Bake in the oven at 220 degrees Celsius for 25 – 35 minutes until golden brown and cooked through. Serve hot, warm or cold with a cos lettuce salad and a squeeze of lemon. – this is a fab dish and I am going to try to make this in individual triangles or “fingers” to see how it will work for a cocktail party as finger food. Will keep you posted! !